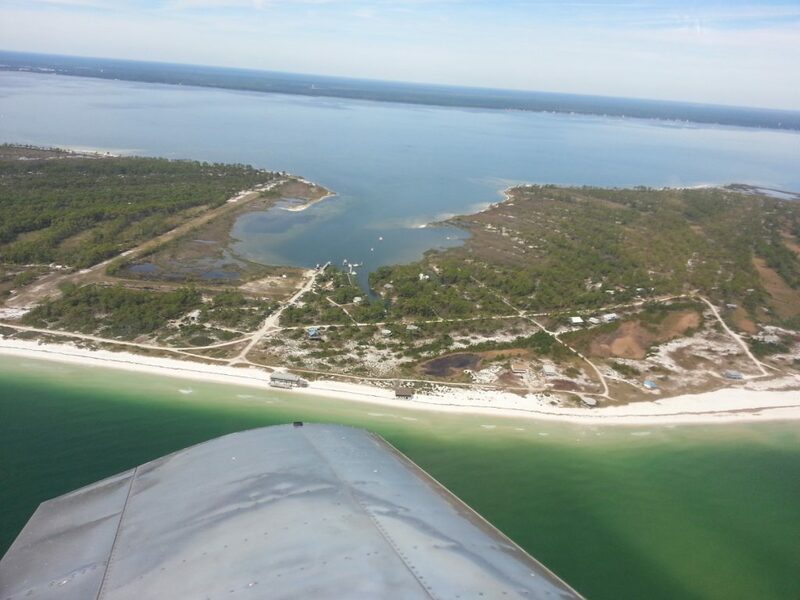 I’ve wanted to fly to Dog Island, Florida since finishing my Sonex. There’s just something appealing about flying to an island that you would otherwise need a boat to get to and landing on a grassy/sandy runway. I even called the manager about a year ago to check on the runway condition. 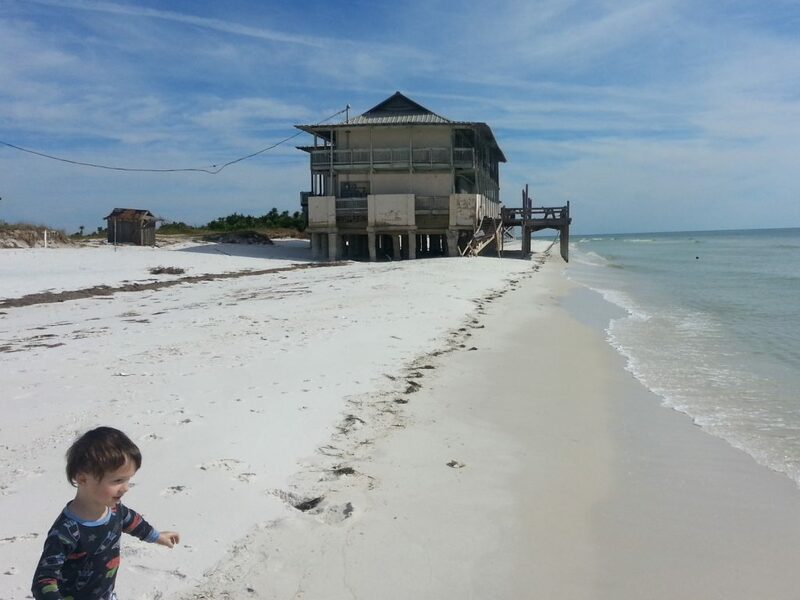 This weekend, during a trip with Philip to visit his grandparents, the two hour detour to check out Dog Island became irresistible. I called the manager again and he used language like “silky smooth” to describe the runway condition. The landing was one of my better recent landings. I used full flaps and crossed the dune at about 60-65mph and used maybe a third of the runway. Philip slept through the entire landing. The ground was slightly damp in places and I had to keep my rpm up around 1500 with occasional bursts to 2000 to maintain a constant speed while turning the airplane around and taxiing to the “ramp”. Parked in the ramp area. The grass/sand here is typical of the entire runway. I imagine larger wheels would be desirable for flying regularly to Dog Island. 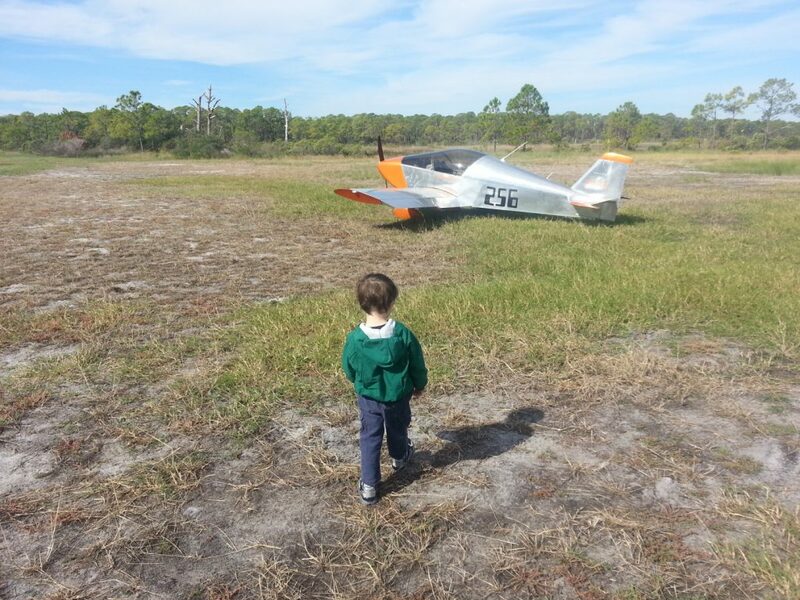 For takeoff, I used 10 degrees of flaps in an attempt to get off the ground and free of the drag from the grass sooner. 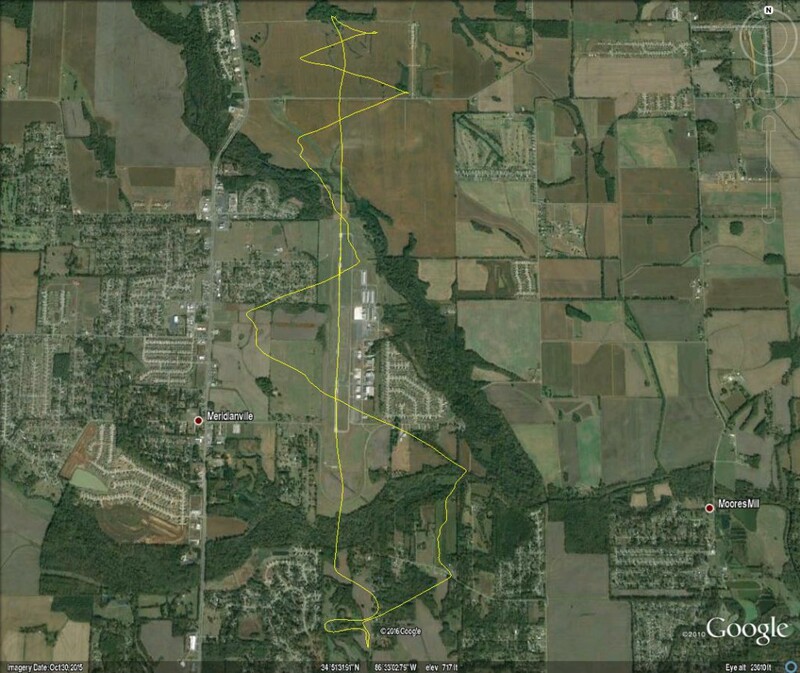 I imagine my takeoff roll was a little longer than at Moontown or other grass runways, but not by much. 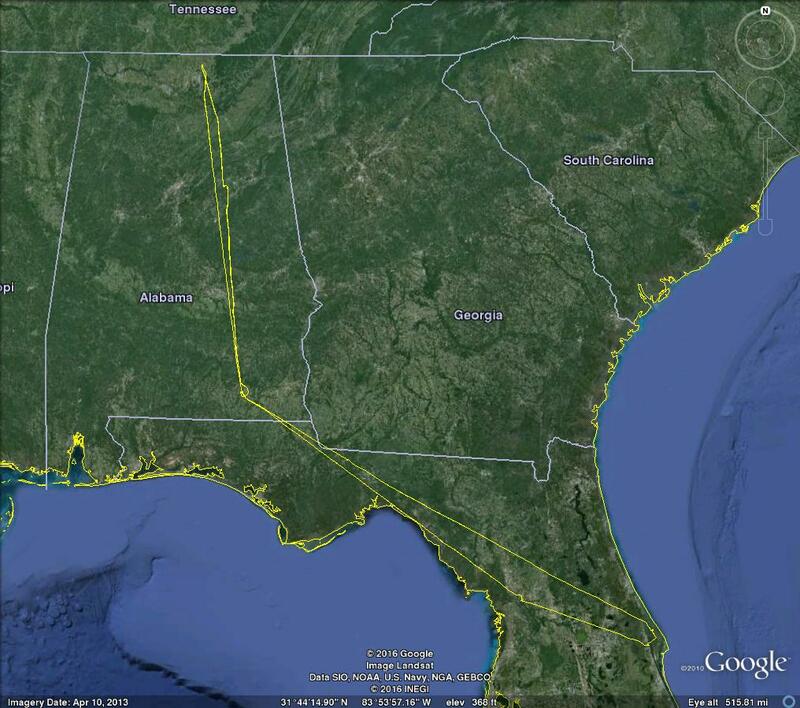 I turned and flew down the coastline while gaining altitude for the 3 mile hop back over Saint George Sound. 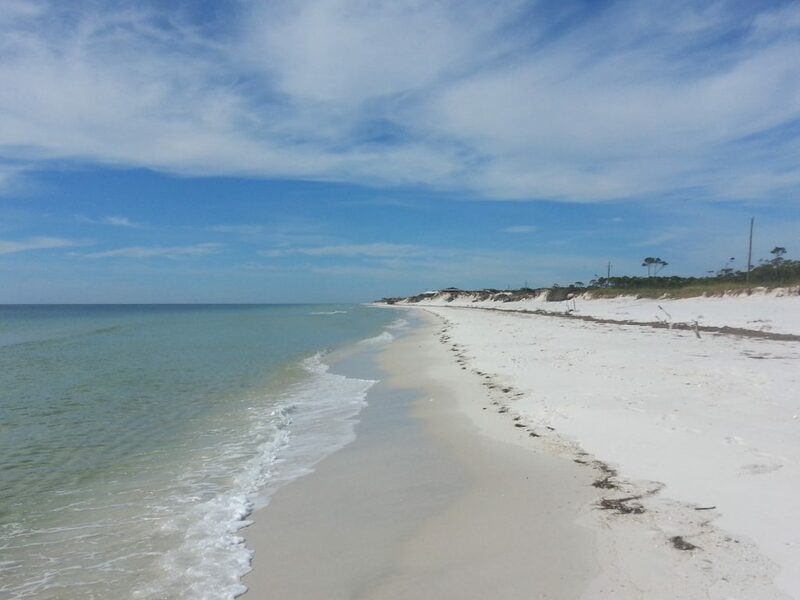 The runway and the beach area we explored by Pelican Inn. Philip was bundled up in two layers of clothes and a coat, which he quickly removed to splash in the waves. The sea shells were pretty impressive–I imagine they aren’t already picked-over like the ones on the mainland beaches. The Pelican Inn looked like it’s probably not currently available for lodging. I believe it was damaged by Hurrican Hermine in 2015. While we were there, a group of official-looking people were walking around the property taking pictures of the foundation–maybe work is under way to fix it up again. On the return flight, we landed at Weedon Field, a nice little airport in Eufaula, Alabama. 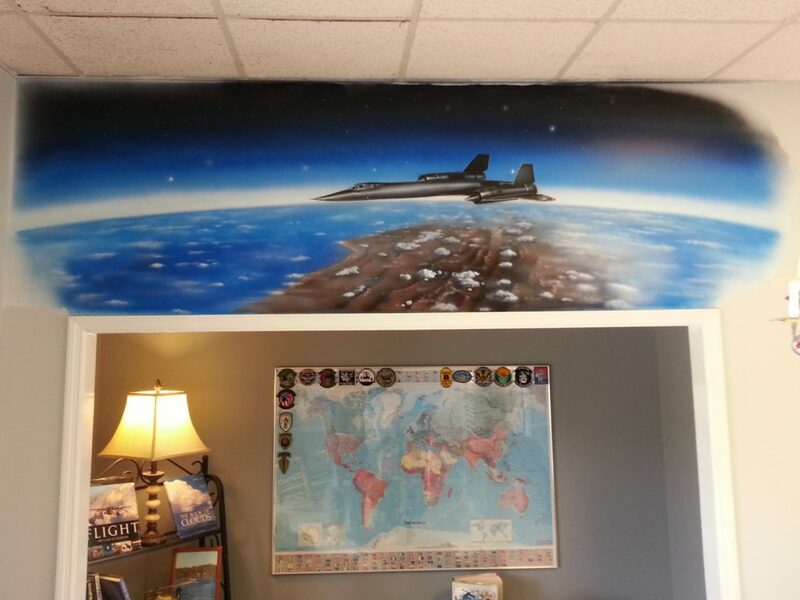 I mention it because of the amazing airbrushed murals on the wall. It was Philip’s turn to go on a long flying adventure. We considered Sun ‘N Fun, but the scheduled launch of SpaceX CRS-8 to the International Space Station with the inflatable Bigelow Expandable Activity Module and the potential of being present for the first successful landing of a rocket on a barge won. 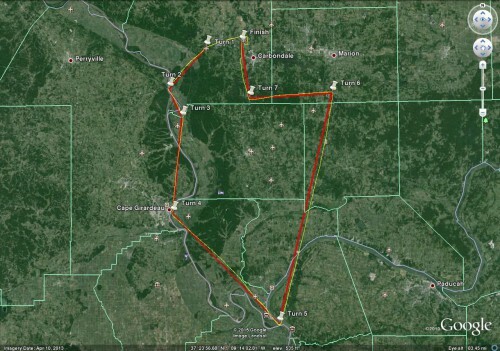 This was Philip’s longest flight, so we planned to spend a night with my parents near the half-way mark on both the flight out and the return flight. Strong winds were a big part of the entire trip. 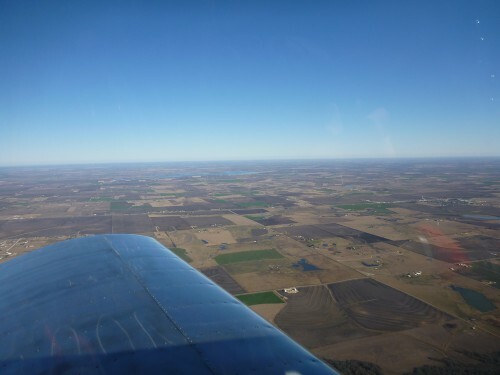 On the first leg the air was so bumpy we found ourselves at 10,500 feet before the ride smoothed out. The time spent climbing and winds combined to cause the trip to take about 20 minutes longer than normal, but the smooth air seemed worth it. On the second day (Launch Day), we arrived at the airport around 08:00 and found the forecast tailwinds I had noticed several days in advance. We saw the ocean from the Sonex for the first time. This part of the Florida coast line is pretty remote and doesn’t have the sandy beaches that I’m used to seeing along the panhandle. 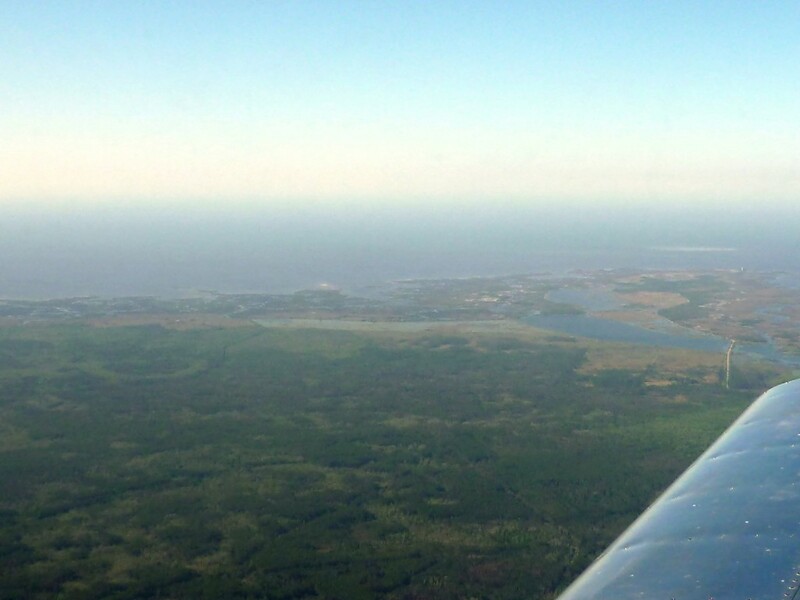 We could have made it all the way to Space Coast Regional in a single leg, but not knowing what to expect transitioning the Orlando Class B airspace, we refueled at Marion County/Dunnellon X35. 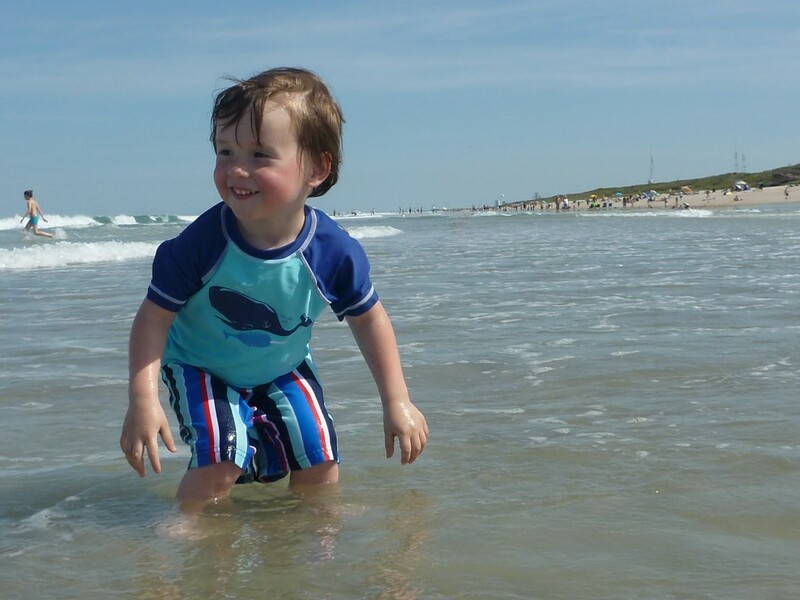 Philip was very excited to get to the beach. I read online that Playalinda beach is a pretty good location to watch launches from. I emphasized the beach part of the trip to him since I was a little worried he might be scared of seeing the actual rocket launch. The water was the perfect temperature. 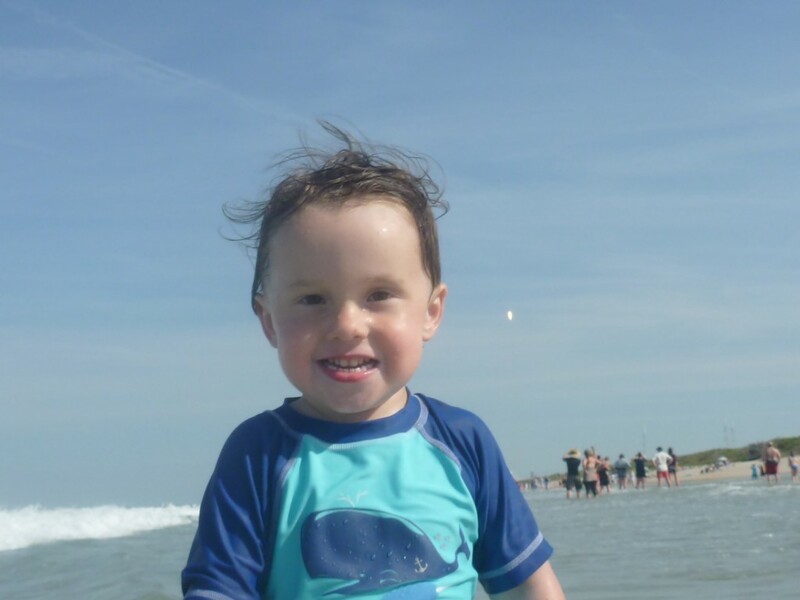 He had a great time splashing and jumping over the waves for the hour or so we waited before the launch (and for an hour after the launch and most people had left). The beach ended up feeling closer to the launch than I expected. The rocket was clearly recognizable as it lifted off. The most impressive part about watching the launch in person was how brilliantly red the exhaust gases are. On computer screens it tends to look white, but the brightness and sharpness of the red flame are impressive in person. I was able to track the rocket until the first stage separated before I lost track of it. Shortly before the launch I let Philip know that the launch was imminent so he knew what to expect. He happily watched the launch and seemed to understand what was happening, mentioning that it was going into space. Anticipating strong winds and turbulence, we planned our departure for early the next morning. 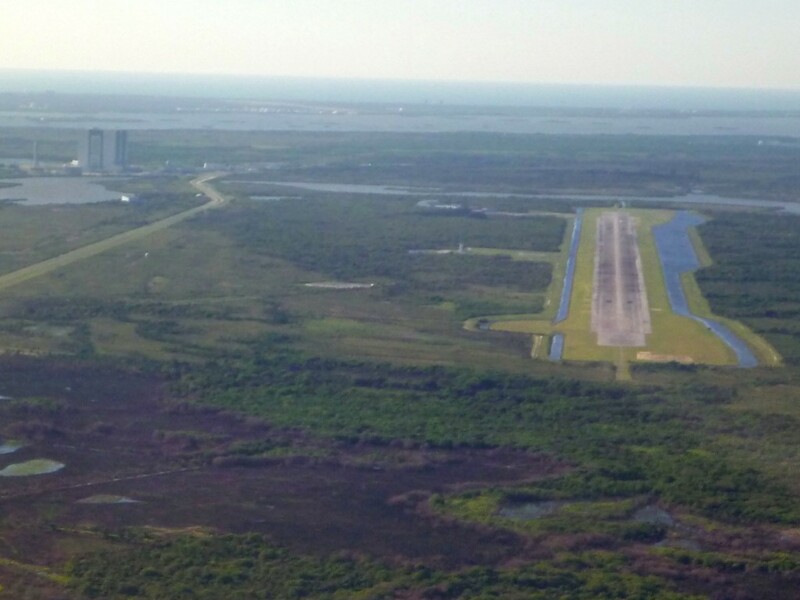 I told the control tower that I was planning to fly over to do some sightseeing at the Shuttle Landing Facility. They had me talk to Orlando who assigned me a squawk code and had me switch to the control tower’s frequency that was acting as a CTAF since the tower was closed. The headwinds on the way back to Enterprise were strong and turned what had been a < 3 hour flight the previous day into a 4 hour one. 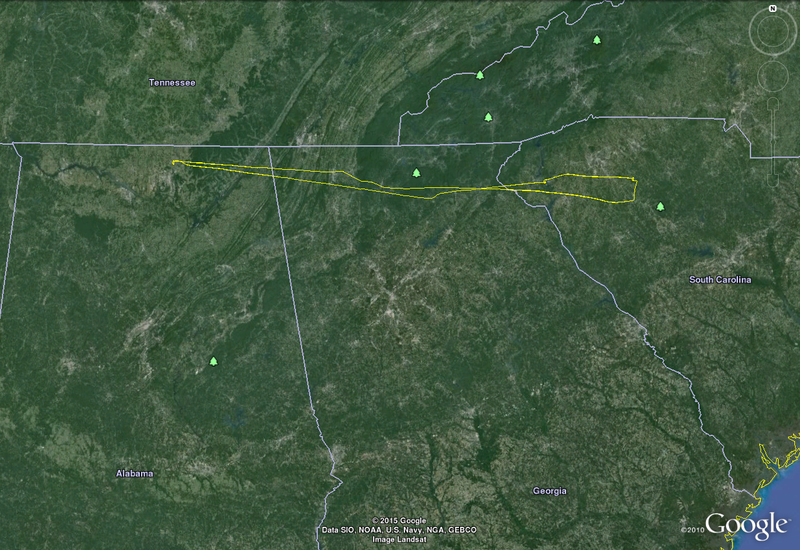 The first couple hours were pretty smooth, but it started getting bumpy as we descended for our fuel stop. 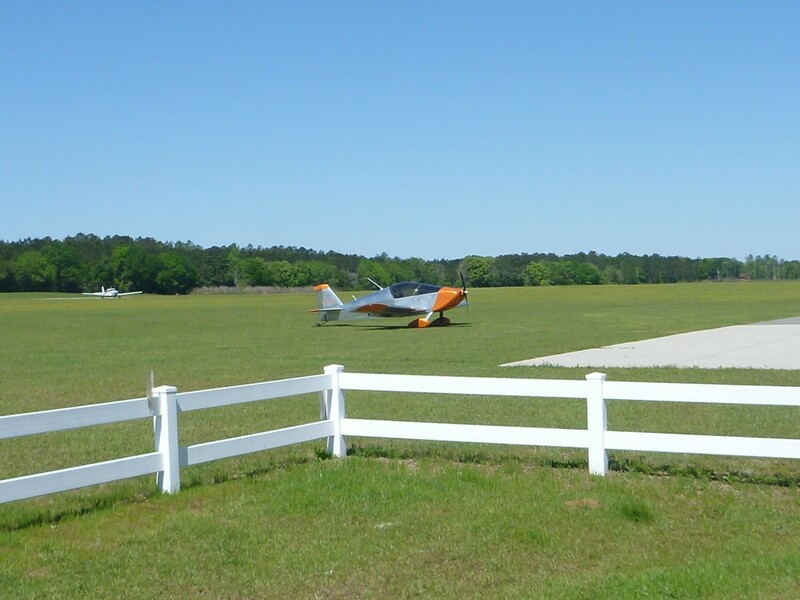 We refueled at Quincy, Florida 2J9 where the runway is an island within a sea of well-maintained grass that is used as a taxiway and a runway. We stayed long enough to watch a couple loads of skydivers land. The runway in Enterprise is oriented exactly perpendicular to the headwind we fought all morning so I fought one last battle against the wind while Philip slept. The wind caused me to go around for a second try, but the second try resulted in what felt like the best landing of the trip. Philip was happy to spend the rest of the day with the complete attention of his grandparents. The morning’s flight back was met with a slight tailwind, smooth air, and a very light rain shower right at our home airport. I was watching the weather forecast and noticed a strong south wind would be blowing in the morning ahead of some evening storms. The surface winds were only predicted to be 10-15 mph, but at only 3000 feet would be 54 mph. 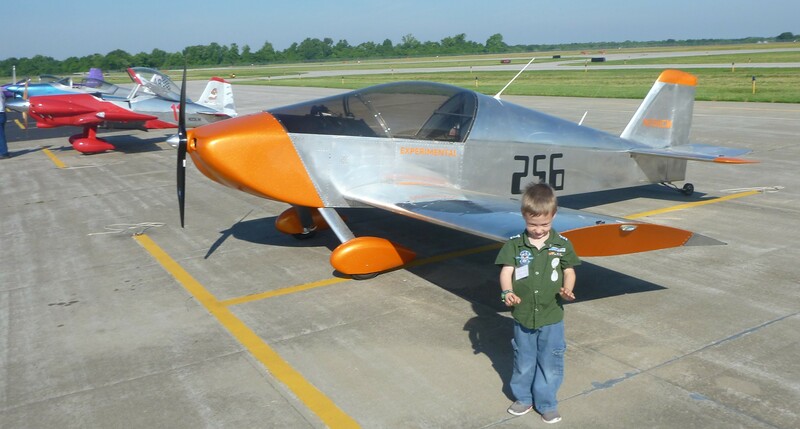 This is faster than the 46mph clean stall speed of my Sonex. The clouds were also forecast to not be a problem. The winds were forecast to be strongest early in the morning, so I arrived at the airport at 5:30am and took off at around 6:00. The winds during takeoff were a little gusty but almost directly down the runway. I got to pattern altitude sooner than normal, but around 2000 feet started to have doubts that the forecast headwind was correct. The air smoothed out and around 3000 feet I was easily moving 10mph backwards. I zigzagged a bit side to side to keep an eye on what was happening on the field. 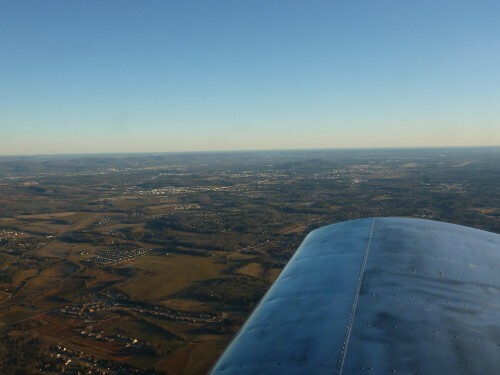 I began my descent north of the runway while still flying backwards and zigzagged intentionally thinking it would allow me to keep making progress backwards while descending into slower air. Once back below about 2600 feet the air was turbulent again and difficult to comfortably keep the airplane close to a stall. 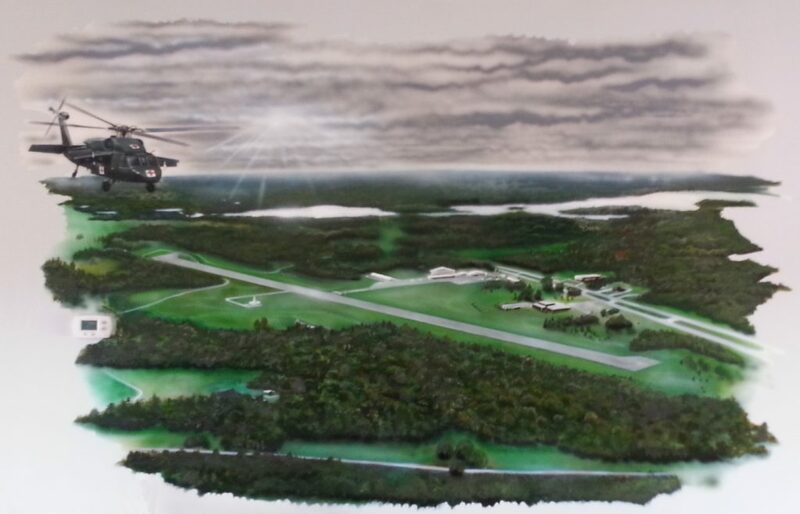 By this time I easily had the field made and flew a normal full flap approach at 70mph down to the runway. 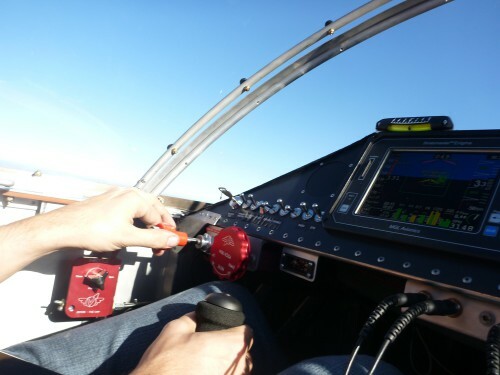 Once above 3000 feet, I was able to maintain altitude easily between 2200-2400 rpm. Oil temperature rose as high as 215F, much higher than it normally would in cruise. 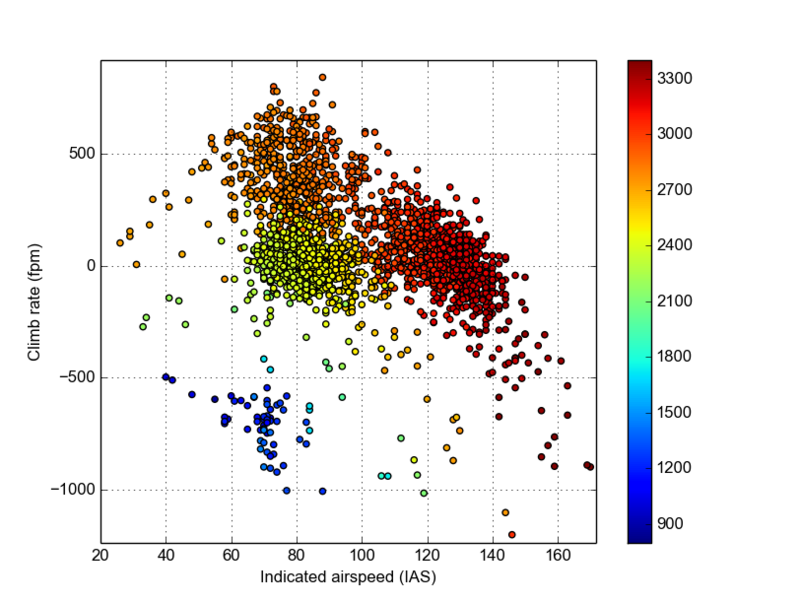 The highest CHT stabilized around 350F, also higher than I would normally expect. 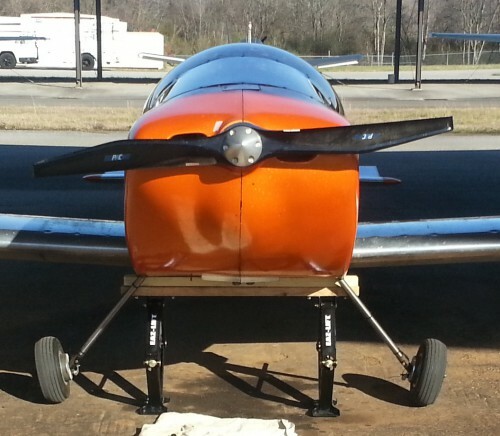 I typically use a bottle jack on cinder blocks with 2×4’s on the bottom of the fuselage to lift one wheel at a time when working on the landing gear. This time, I needed to remove my axles to repair elongated bolt holes that seem to be causing some shimmy on landing. For this I wanted a more stable platform. The simplest solution seems to be cutting a sawhorse a little taller than the bottom of the fuselage and lifting the tail while someone slides it into position. The sawhorse is either positioned at the spar tunnel or as far forward as possible on the fuselage. I typically work on the airplane alone and briefly considered and abandoned a trick method using ropes to position the sawhorse. I have a mental image of somehow getting stuck holding the tail up while the sawhorse is awkwardly pusitioned to dent my wing. 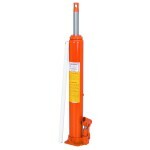 A popular method on the vansairforce forum involves these hydraulic jacks from harbor freight. 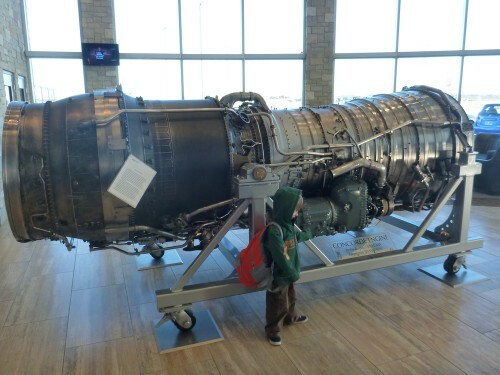 Unfortunately, they are 24″ tall and the bottom of the Sonex fuselage is 19″. Scissor jacks seemed like a good solution, but I kept finding small ones intended for cars. Securely mounting two of them to 2x4s seemed like it might be a challenge and would be dependent on the exact design of the jack. 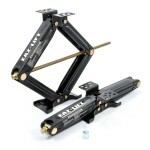 I stumbled across these 24″ tall “leveling scissor jacks” on amazon. They come with all the hardware needed to attach them to 2x4s and mine came with a hand crank rather than the drill attachment they advertised. I much rather have the hand crank. 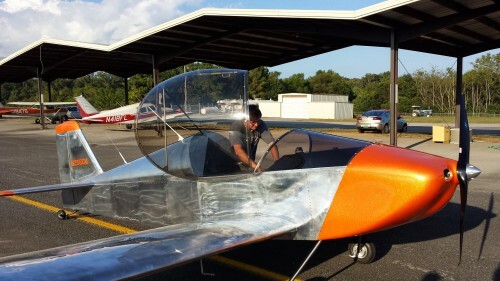 I was easily able to lift the airplane and the airplane felt very stable. I originally intended to attach 2×4 boards running fore and aft to the bottom of the jacks to increase their footprint, but the feet on these jacks are already pretty big so I left them off. I’ve been curious about the balance of my propeller/engine combination. 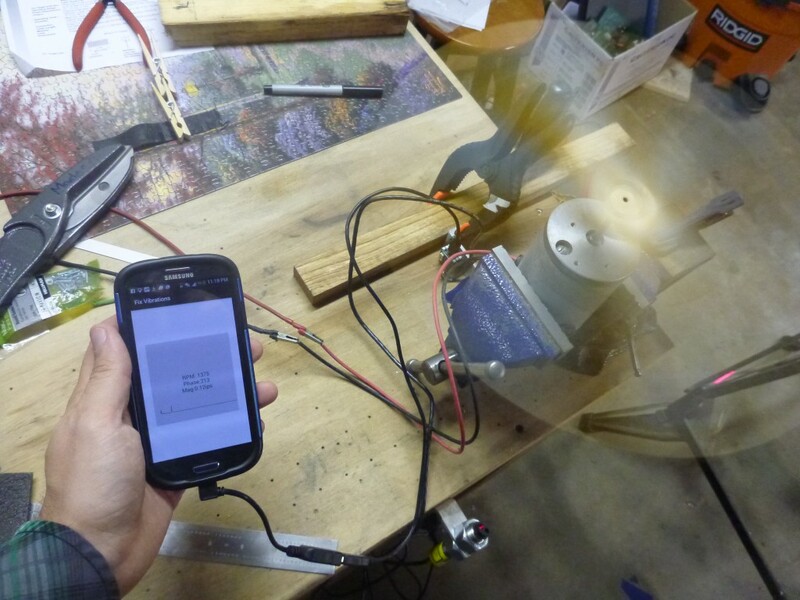 Rather than find someone with access to a dynamic balancer, I decided to design and build my own. 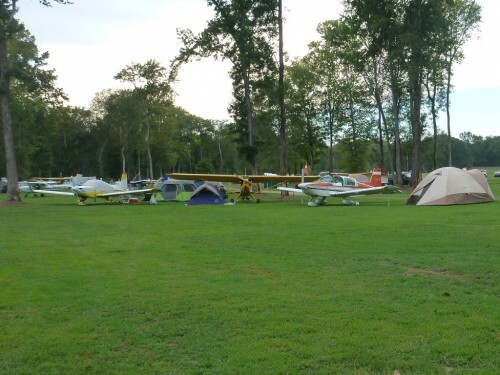 I learned about the Triple Tree fly-in the day after it started and decided Nathan and I couldn’t wait for next year and absolutely needed to check out the 7000 foot grass runway and see what airplane camping is all about. I originally planned to fly a direct route to the Walmart rally point where the approach into the fly-in begins. 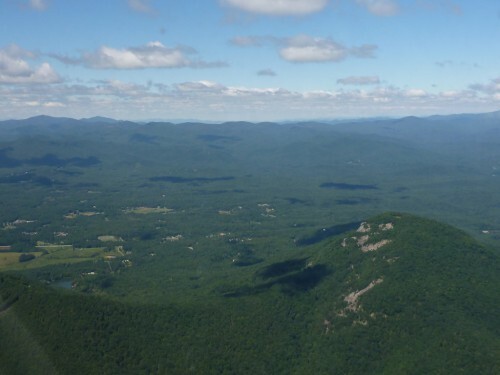 The clouds limited me to about 4,500 feet–lower than I felt comfortable crossing the unfamiliar Appalachians, so we adjusted our course south and only added a few minutes to the entire trip. 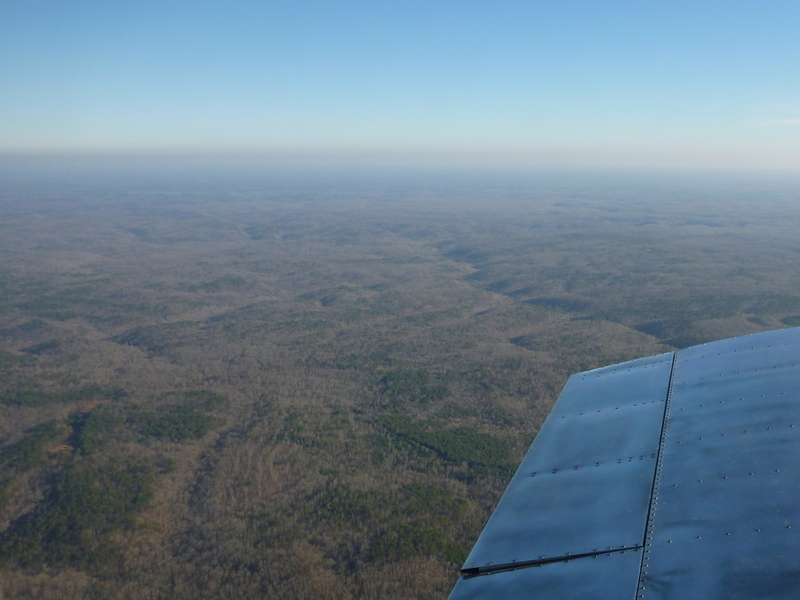 Despite crossing further south in the Appalachians than I originally planned, the scenery was still some of the best flying scenery I have experienced. In the foreground is Yonah Mountain. According to Wikipedia, it is a popular training ground for rock climbers and used by Army Rangers for training (it even has a helipad). After landing, we got to off-road the airplane through the trees to our camp site. 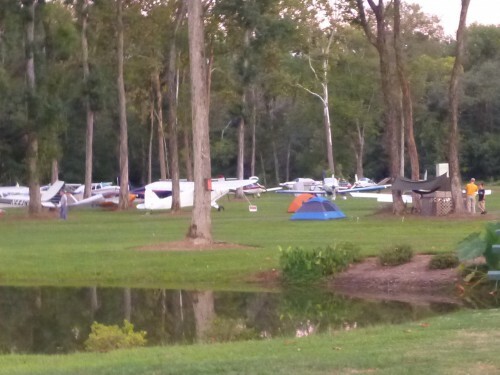 The camp grounds were very well maintained with no significant sticks or rocks and the bumps didn’t damage my wheelpants–my main concern at the time. 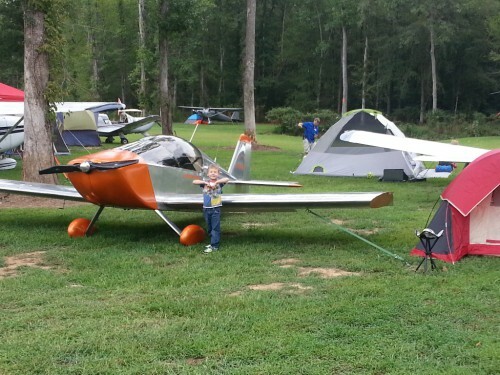 It took a little longer than expected to get the airplane tied down and the tent set up due to the number of people who showed up wanting to see and ask questions about the Sonex. 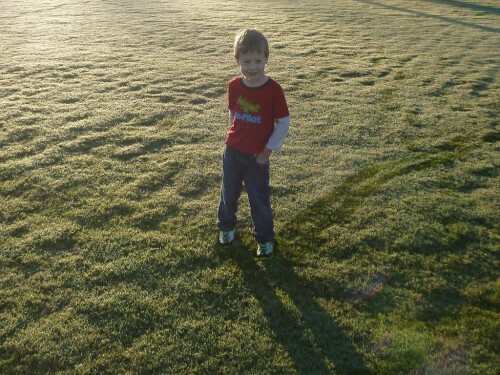 Here’s Nathan posing after all the visitors left and we finished setting up the camp site. 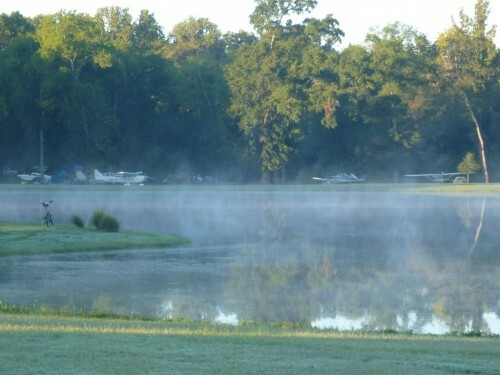 There are small ponds and walking bridges throughout the campground. The shower/restroom facilities are fantastic. 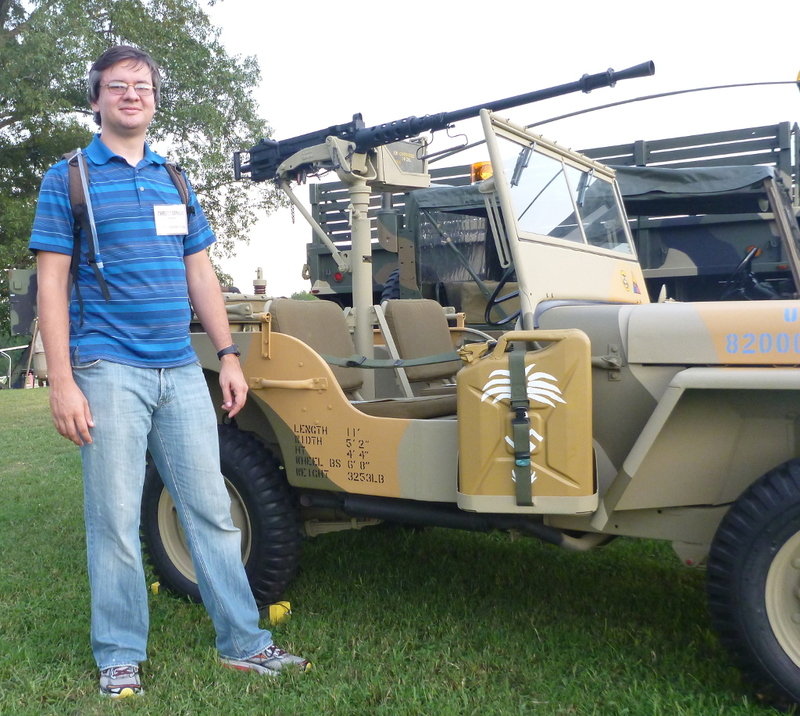 In addition to airplanes, there was a collection of restored military trucks to look at. A nearby cannon was used to fire the wakeup call in the morning. We had BBQ from dinner while listening to live music and watching low passes, take-offs, and landings of Air Cams, the C-46 Tinker Bell, and all sorts of radial-engined airplanes. Here Nathan’s eating the kid’s hot dog meal. 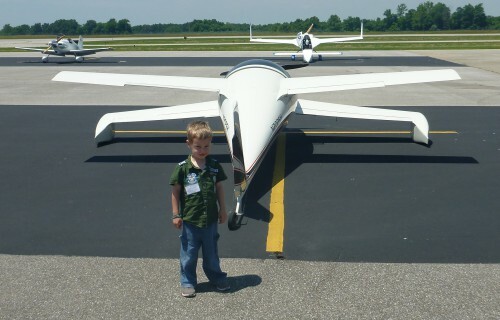 Notice the air traffic control tower in the background. 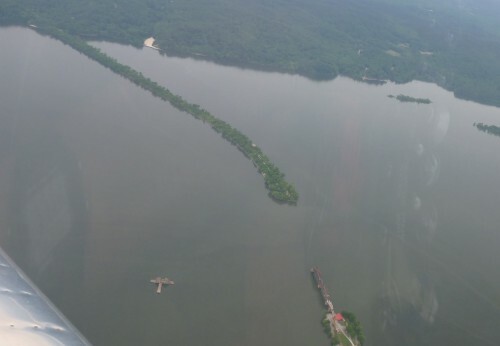 This lake is where the seaplanes land. It got a little cold over night and we woke up to dew on the ground and mist rising from the pond. We found some ground where the sun was shining to warm up before eating a nice big breakfast of eggs, sausage, muffin, potatoes, and orange juice. We left the fly-in Sunday a little before lunch. 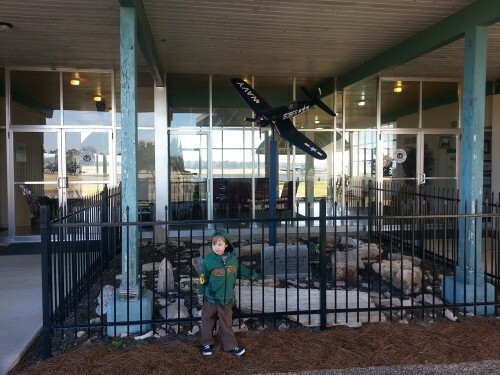 We made an early unscheduled pit-stop for a restroom break, fuel, and snacks near Clemson university at Oconee County Airport (CEU). 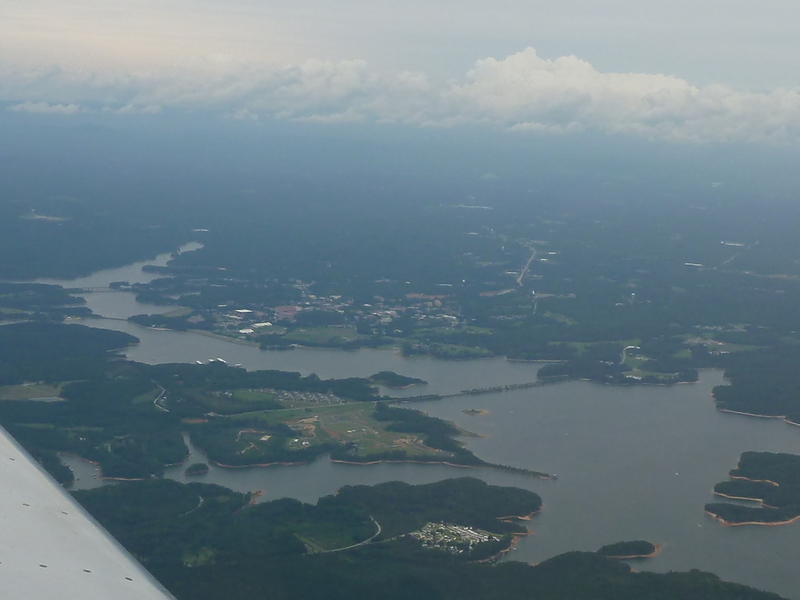 The stadium is visible in this picture of the northern portion of Lake Hartwell from the flight out. Nathan and I visited my sister and her family in Austin, Texas. 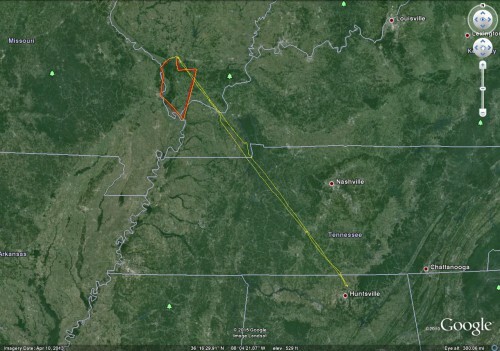 The round trip flight was 1,506 miles and took 12.6 hours flight time (119 mph average). We used 50 gallons of fuel (30 mpg). Looking south over the Bankhead National Forest. 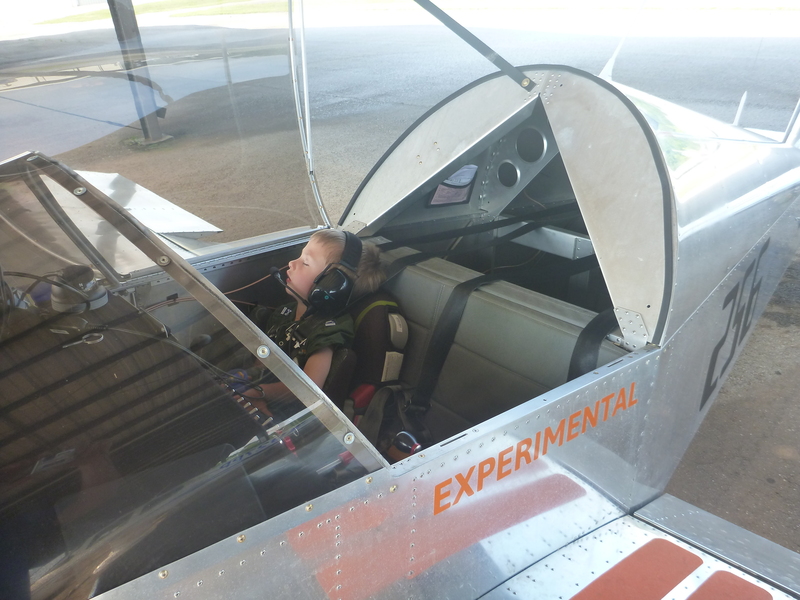 We departed Huntsville Executive late in the day so Nathan didn’t have to miss any school. This meant we arrived in Vicksburg at 5:05 pm. We quickly got fuel and departed, hoping to make it to Natchitoches, Louisiana for the night. We weren’t quick enough and it decided to turn around and stay in Vicksburg. The guy who fueled the plane said he wished we made up our mind earlier since the headlights in the courtesy car weren’t working. The airport manager let us borrow his “baby”, a Chevrolet pick-up truck. He seemed doubtful that I would know how to drive a stick, but I think I passed the test backing out of his driveway. 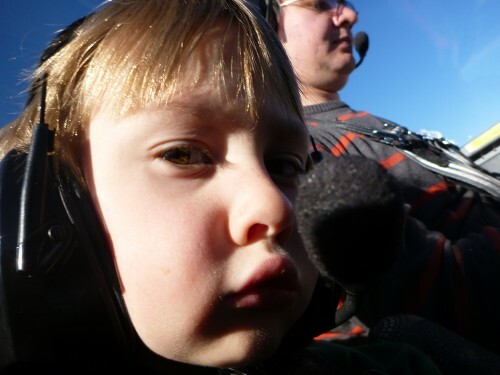 We appreciated the generosity and Nathan loved getting to ride in a truck. We drove back across the Mississippi river and stayed at the Candlewood for the night where Nathan got to swim in the indoor pool. Unfortunately, it was not possible to use my points to make the reservation from the front desk, and I’m pretty sure they charged more than if I had booked over the phone/internet, but we were happy to have somewhere to stay. The temperature dipped below freezing during the night and the dew that condensed on the airplane frosted, so we cranked the engine and waited in the sun for the oil to reach temperature and the frost to melt. Both happened at about the same time. The FBO here is really nice and even has a cafe. We were in a hurry to make it to Austin, so we just grabbed cookies from the snack machine. One of the cookies eventually got shared with Nathan’s cousin. 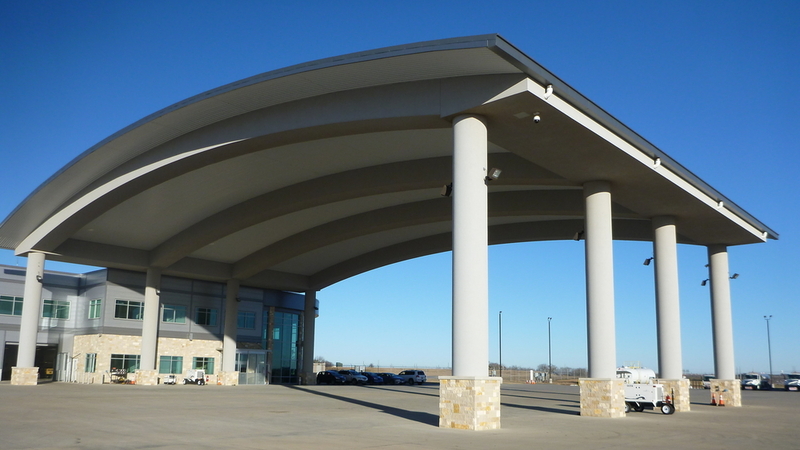 Austin Executive has a huge canopy you can pull use in inclement weather. 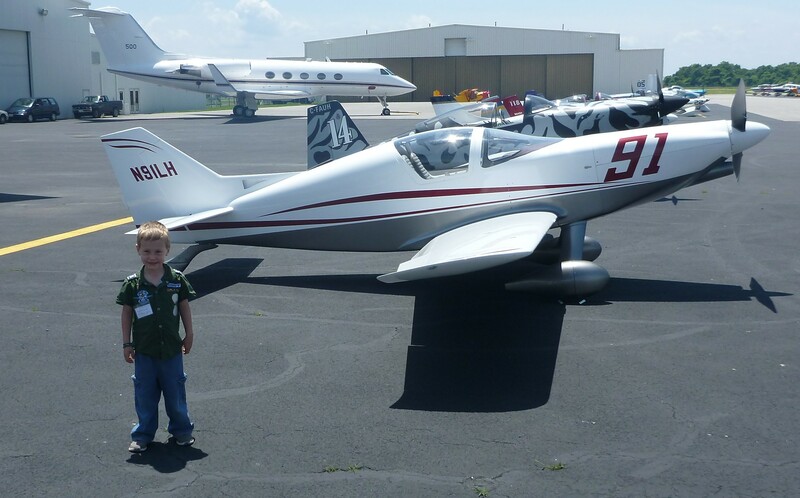 They can tow your airplane to a tie down or hangar when you leave and have it waiting for you when you get back. We told the line-man we’d rather just taxi to a tie-down. Austin Executive has expanded significantly in the last 8 years or so. 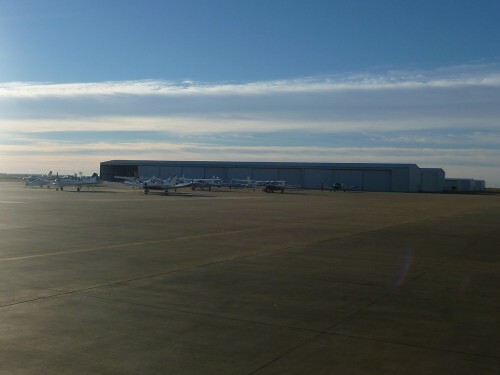 The runway is new and the FBO is newer. 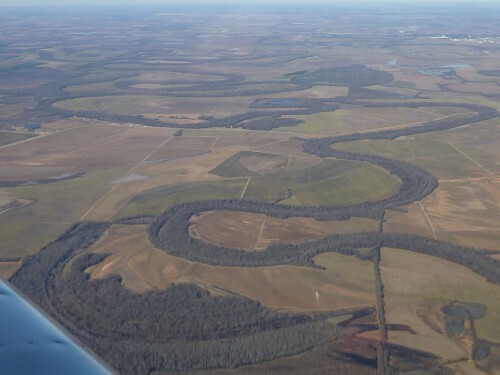 Much of east Texas looked just like this. The air was smooth and peaceful with a hint of a tailwind. We had a great time visiting with my sister and her family. 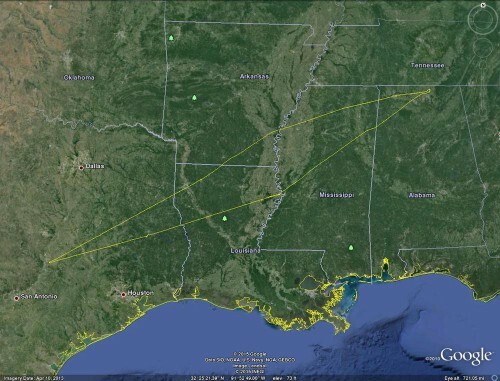 I chose a slightly more northerly route for the return trip so we could see new sights and fly through an extra state (Arkansas). Nathan took hundreds of pictures over the course of a couple hours. Here I’m fine-tuning the mixture to squeeze out the last bit of power. This is my favorite picture picture he took. He’s a pretty serious guy when we’re in the airplane, but when we get out he always has stories to tell. 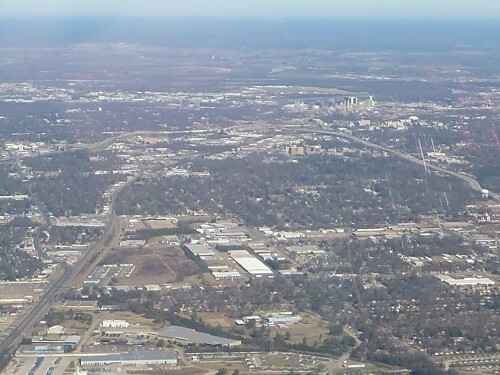 Shreveport, Louisiana was the largest city we saw on the trip. Shreveport Approach let us fly through their airspace, but asked that we stay above 2,500 feet (we were cruising at 3,500). The FBO here was very simple. The only person staffing the FBO drove a fuel truck over and fueled us up. I removed the cowl and added oil while Nathan sang and danced on the ramp. We were parked in front of two large hangars without front doors. The open hangars reflected Nathan’s singing back at us at almost full volume. Not long after departing, we picked up a fantastic 20mph tailwind. I revised our planned fuel stop a couple of times. 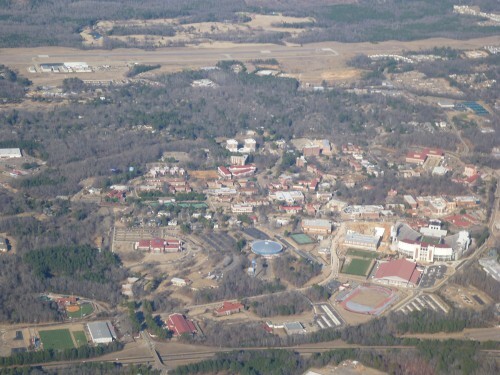 One of the options we passed up was in Oxford, Mississippi. 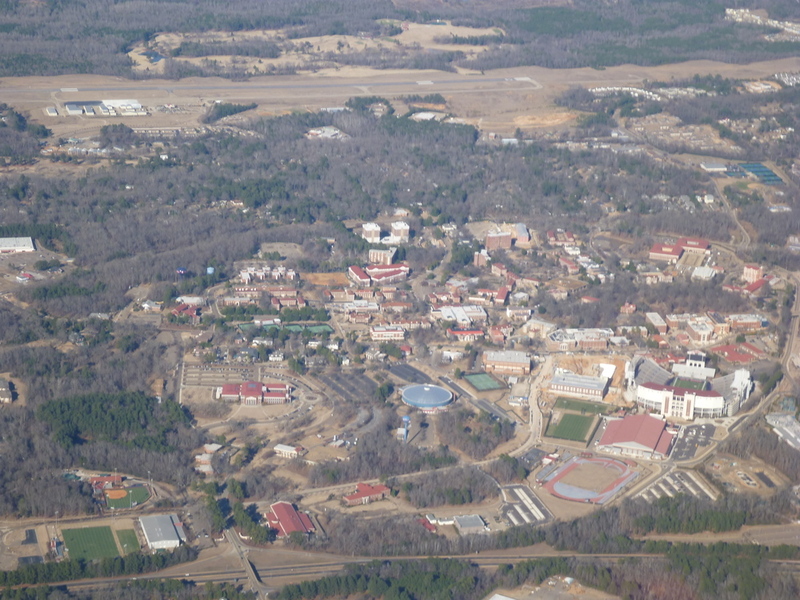 I snapped this picture as we flew by and only later realized it is the University of Mississippi “Ole Miss” campus. We could have made it back to our home airport, but decided to make a final fuel stop in Muscle Shoals about 30 minutes from home. 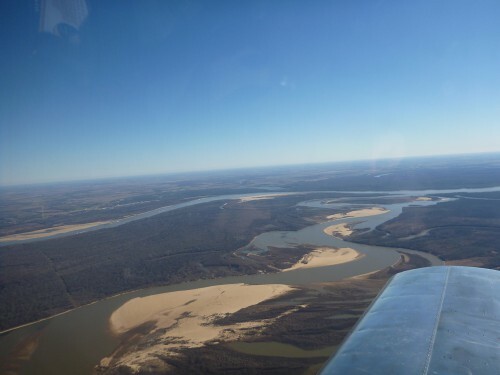 It turned out to be a good thing since Nathan was feeling slightly airsick from some of the turbulence we found in eastern Mississippi. The time we spent walking around on the ramp cured him. We had a brief scare when the FBO informed us the FAA wanted to talk to us. My mind raced through all the possible mistakes I could have made, but couldn’t think of any specific one. After a brief wait they said the FAA was looking for a different airplane and we were okay to leave. What a relief! 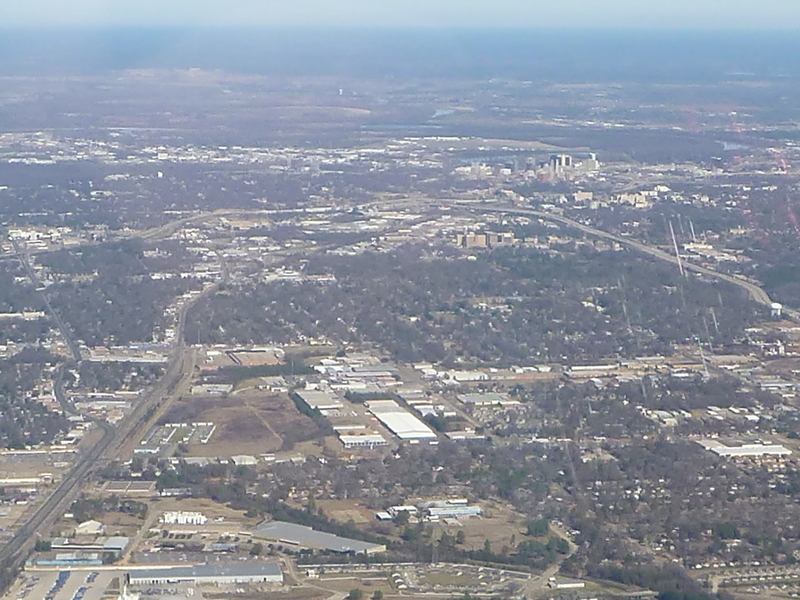 Here we are returning to the familiarity of Huntsville, Alabama. 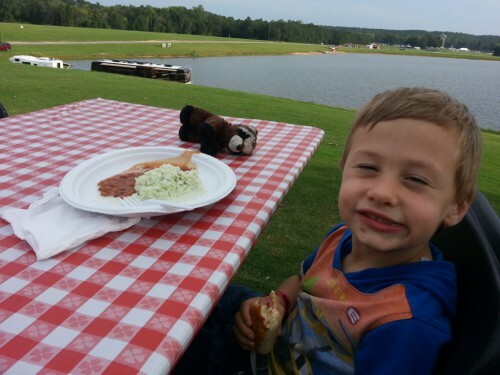 Nathan even recognized the Saturn V rocket in the distance.